It really is fun pulling into the driveway and seeing the Ice Cream Club box sitting in the driveway. Four tasty secrets just waiting to be discovered! Oh boy! I let my daughter pick what we were going to try. Though this container looks huge, it's only 1 pint ...and she thought by picking it I would let her have the whole thing.Well, we each had one serving (1/2 cup, or a 1/4 of the container). 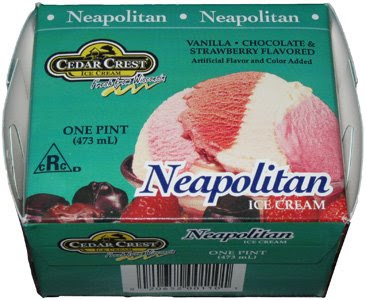 As a Neapolitan, this isn't anything groundbreaking, but it is a quality ice cream. We quickly ate our servings and contemplated finishing off this cute little box. It's nice, I like it, but I would like to try some of their more unique offerings. Stay tuned for the other, more unique choices that we have to try this weekend.